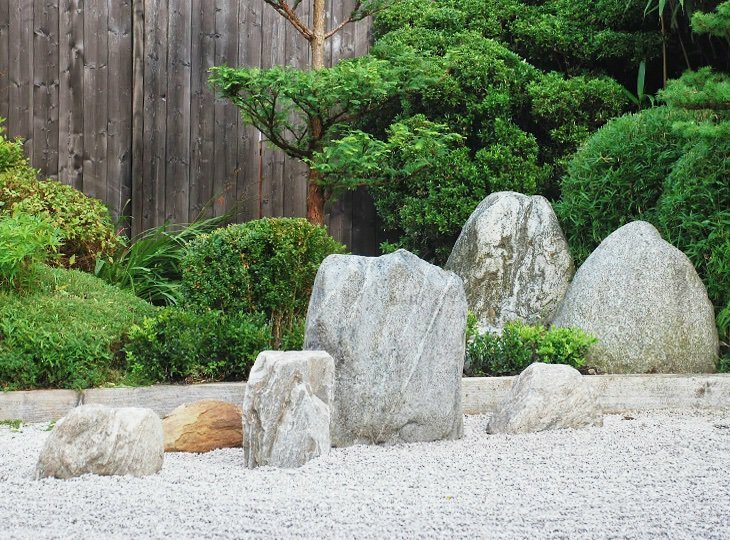 The selection and placement of rocks is the most important part in building a Japanese garden. In the first known manual of Japanese gardening, the Sakuteiki, creating a garden is expressed as "setting stones", ishi wo tateru koto; the act of setting stones upright. It laid out very specific rules for choice and the placement of stones, and warned that if the rules were not followed the owner of the garden would suffer misfortune. In Japanese gardening, rocks are classified as either tall vertical, low vertical, arching, reclining, or flat. For creating "mountains", usually igneous volcanic rocks, rugged mountain rocks with sharp edges, are used. Smooth, rounded sedimentary rocks are used for the borders of gravel "rivers" or "seashores." In Japanese gardens, individual rocks rarely play the starring role; the emphasis is upon the harmony of the composition. For arranging rocks, there are many rules. For example: "Make sure that all the stones, right down to the front of the arrangement, are placed with their best sides showing. If a stone has an ugly-looking top you should place it so as to give prominence to its side. Even if this means it has to lean at a considerable angle, no one will notice. There should always be more horizontal than vertical stones. If there are "running away" stones there must be "chasing" stones. If there are "leaning" stones, there must be "supporting" stones." Rocks are rarely if ever placed in straight lines or in symmetrical patterns. The most common arrangement is one or more groups of three rocks. One common triad arrangement has a tall vertical rock flanked by two smaller rocks, representing Buddha and his two attendants. Other basic combinations are a tall vertical rock with a reclining rock; a short vertical rock and a flat rock; and a triad of a tall vertical rock, a reclining rock and a flat rock. Other important principles are to choose rocks which vary in color, shape and size, to avoid rocks with bright colors which might distract the viewer, and make certain that the grains of rocks run in the same direction. Please be advised Yokoso Japanese Gardens can also assist in the search for, purchase or lease of authentic Japanese rocks & stones and granite ornaments for you. Products that you won't be able to find on our website can, most likely, be ordered. Please use our contact form. Provide a clear description of the desired product and a reference to a picture on the internet and we will try to find the product for you. We would be happy to invite you to our Japanese garden center. We have a wide range of original, authentic Japanese ornaments, rocks, stones, decoration, plants and trees for your Japanese garden project on stock. Our Japanese garden center is unique in Europe and is open by appointment. Contact us today for an appointment.